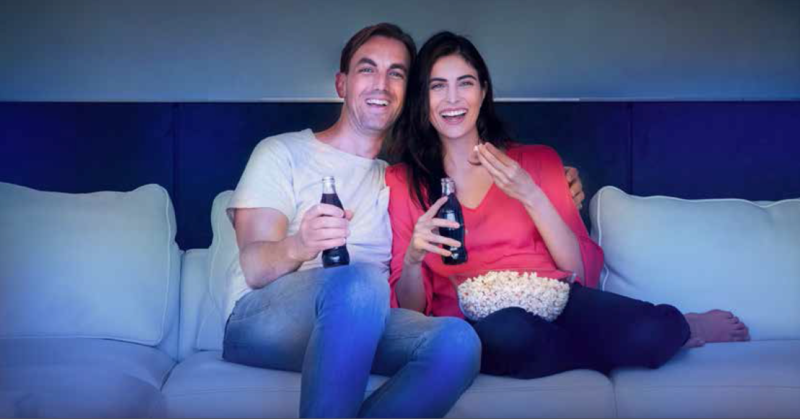 Experience the cinema-quality entertainment you’ve always dreamed of. The beautifully styled VPL-VW870ES represents a new landmark in home cinema technology, achieving extraordinary levels of picture performance. The long-lasting laser light source delivers a powerful 2,200 lumen output for exceptional images, even in larger home cinema rooms and well-lit living spaces. Laser light levels are precisely controlled in real time, assuring truly spectacular dynamic contrast range with the latest 4K HDR content, ensuring the most accurate reproduction of the director’s vision. 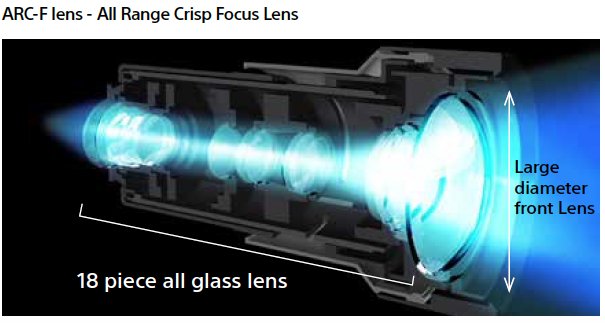 The VPL-VW870ES features an ARC-F (All Range Crisp Focus) glass lens, ensuring the highest quality image reproduction that reaches every corner of the screen. Achieve complete clarity and focus with new Digital Focus Optimiser technology, so you’ll never miss any detail. Featuring the latest 4K processor for home cinema projectors, Reality Creation technology analyses every object of the image while upscaling Full HD content for an incredible 4K experience, so you’ll always get the best from your content library, with extraordinary clarity, colour and contrast. The VPL-VW870ES automatically adjusts contrast for optimum picture quality by analysing dark and light areas in every scene. 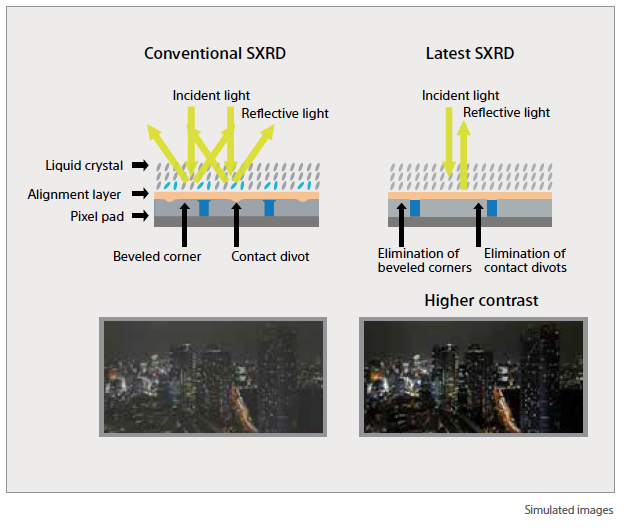 Advanced SXRD panel technology features a highly reflective liquid crystal layer and an alignment layer without bevelled corners or contact divots, enabling an ultra-fast response rate of just 2.5 milliseconds. 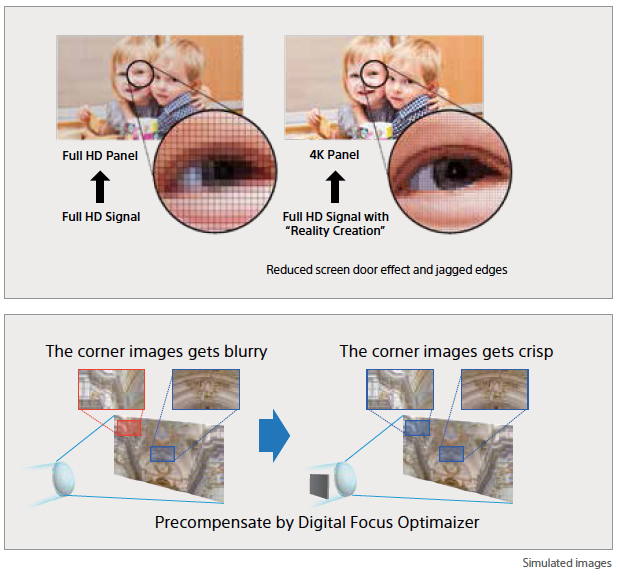 Space is minimised between adjacent pixels for dot-free pictures with deep contrast. Remarkably compact and elegantly styled, the VPL-VW870ES is beautifully easy to operate with a choice of picture modes for outstanding results with any content. With generous connections and interfaces, it also offers great flexibility for smooth integration in any AV entertainment set-up. Enjoy movies and streaming services in 4K HDR with a far wider range of brightness and content, thanks to HDMI 18 Gbps compatibility, from sparkling highlights to rich, deep blacks. Whatever you’re watching, you’ll enjoy a more lifelike entertainment experience with extremely high contrast, exquisite colour and fine detail. 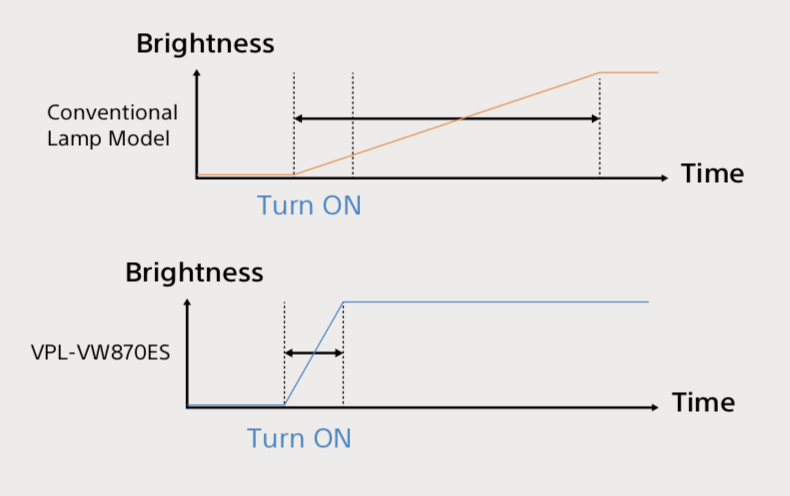 Through the use of precisely controlled laser light levels in real time and Advanced Iris technology, an exceptionally high dynamic range contrast ratio of ∞:1 can be achieved. The VPL-VW870ES can project 4K content at up to 60 frames per second, the latest 4K industry standard that’s much higher than the earlier 24p. 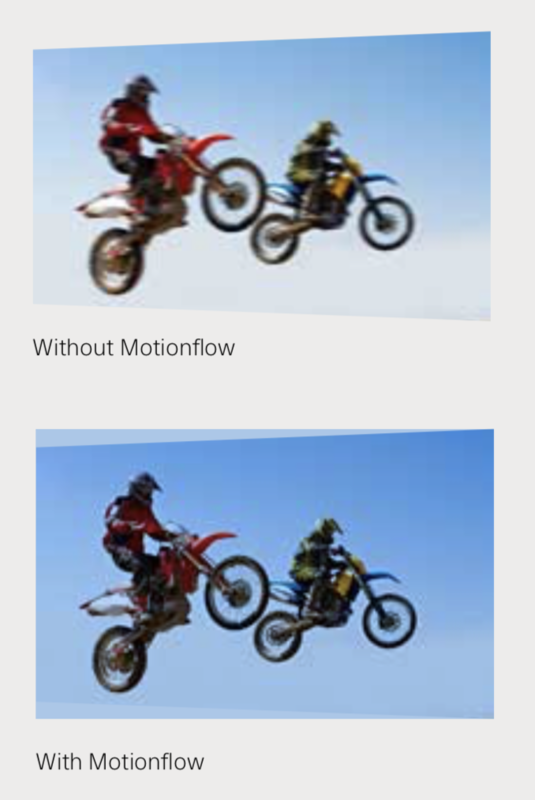 The result is smoother, more realistic images, especially with fast-paced action. 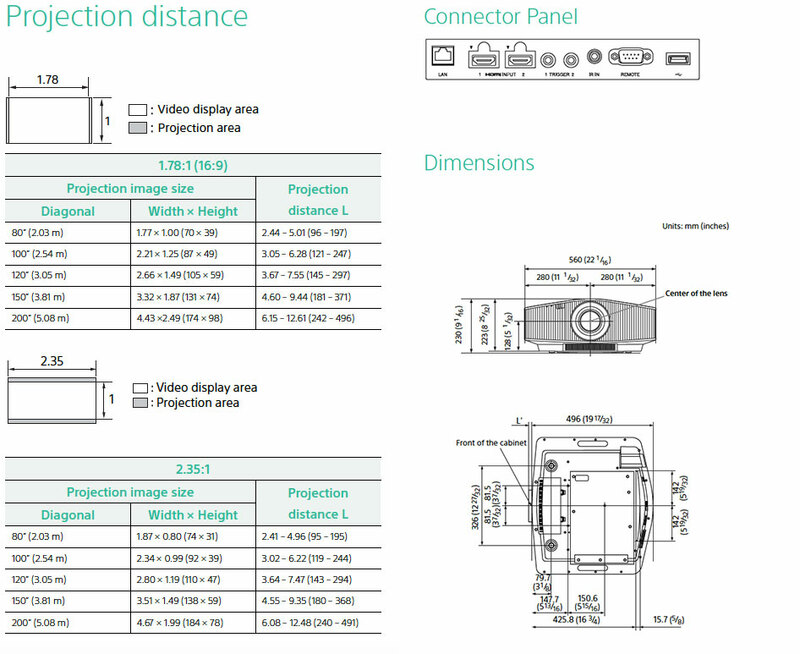 And with support for HDCP 2.2, you’re future-proofed to make the most of today’s premium 4K releases – and tomorrow’s. A great feature for gamers. 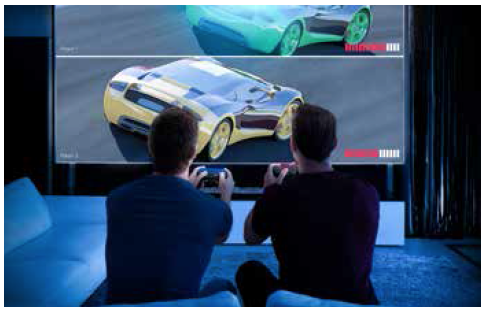 Experience 4K 60P games and our fastest ever response time between the controller and screen for ultimate gaming action, with low input lag of 27msec, even when you’re playing the latest 4K titles. As well as native 4K material, you can see your current Full HD Blu-ray™ or DVD movie collection upscaled for a 4K experience. Featuring the latest 4K processor for home cinema projectors, Reality Creation technology analyses and radically enhances Full HD content, even upscaling 3D movies for 4K. 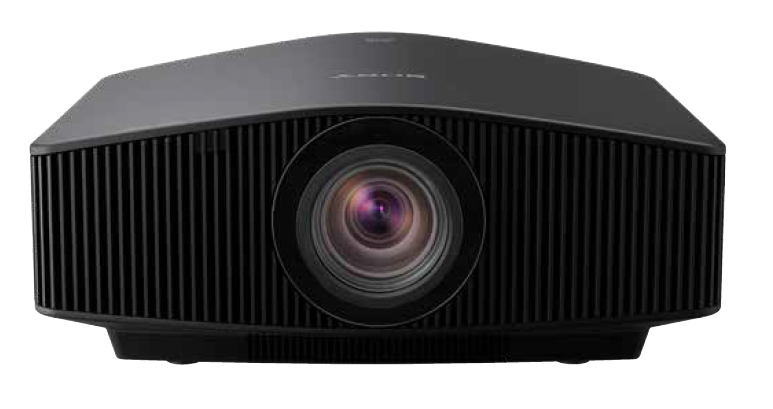 In collaboration with 4K Reality Creation, the projector will digitally compensate for any focus or abnormalities in the lens profile to create exceptional detail across the whole image. Take full advantage of UHD Blu-ray Discs featuring the highest quality content in 4K resolution and High Dynamic Range. A 2.06 motorised zoom lens and wide lens shift range of up to 80% vertical and 31% horizontal gives greater installation flexibility – even when the ceiling is very high. 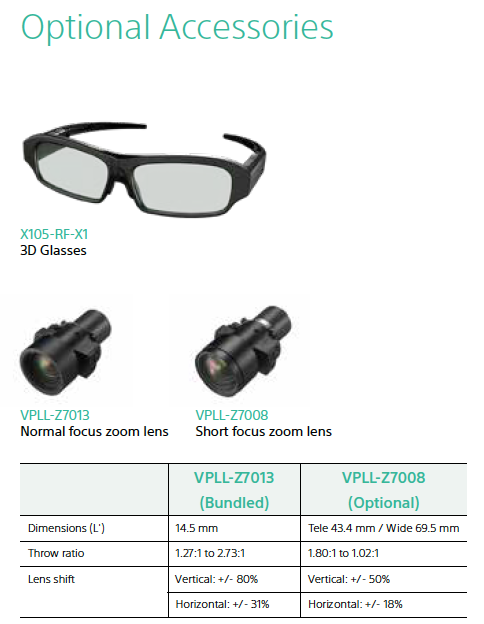 The VPL-VW870ES comes with the VPLL-Z7013 as standard, with the optional VPLL-Z7008 wide angle lens also available for further flexible installation conditions. The VPL-VW870ES is compatible with many home automation systems, including Crestron Connected and Control4 SDDP. 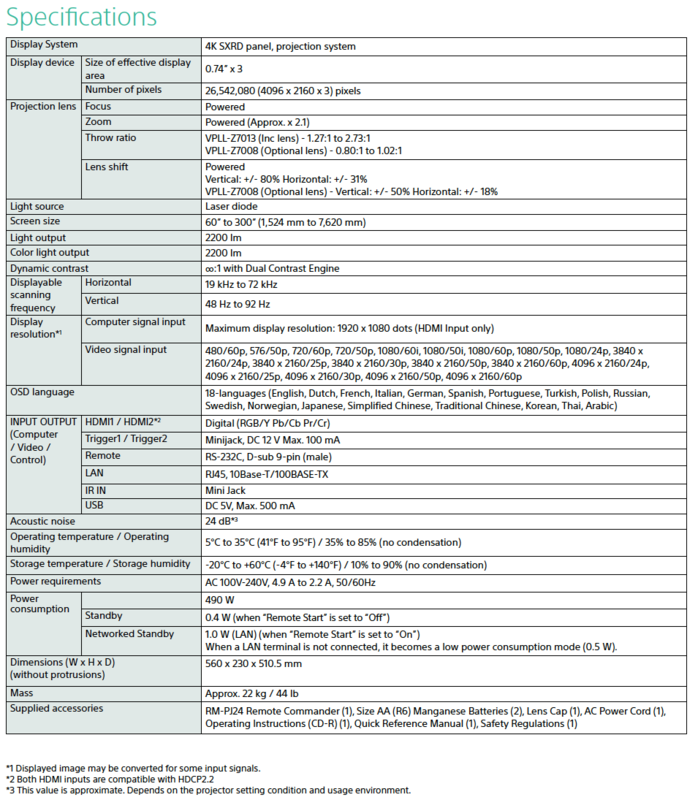 It offers an RS232 interface, RJ45 control and IR-IN terminal. Precisely adjust gamma plus hue, saturation and brightness for each colour to create exactly the picture you want. 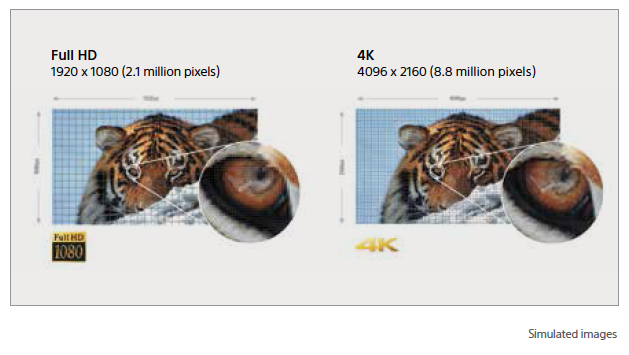 Sony’s advanced TRILUMINOS™ Display technology reproduces a much broader colour range, reproducing more tones and textures than standard projectors. You’ll see the difference with greater colour purity, depth and realism in every scene. After extended operating periods, colour can be automatically calibrated to match the original factory settings. There’s no need for special calibration equipment: you’ll enjoy consistent colours with every performance. 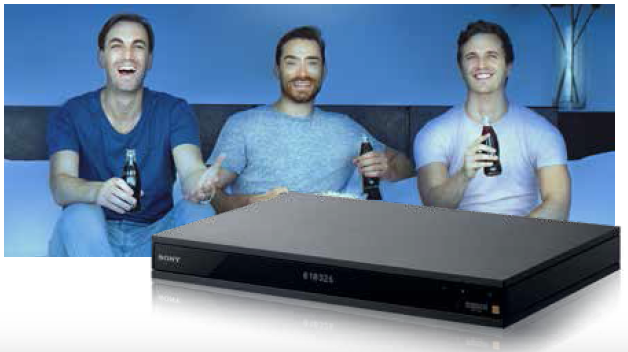 The VPL-VW870ES is ready for premium 4K content, including TV, internet streamed productions and satellite broadcasts. To get the best from your projector, the VPL-VW870ES has USB ports to automatically receive the latest firmware updates, directly to the projector. The projector’s efficient, longlasting laser light source offers up to 20,000 hours* virtually maintenance-free operation, with minimal drop-off in image brightness over the laser’s long operating life. *Actual hours may depend on usage and operating conditions. The laser projector can be turned on and off quickly. Enjoy uncompromised 4K images, with no artificial pixel enhancement. High Dynamic Range takes you closer still to reality with higher contrast, richer colours and a wider range of brightness levels from deep, dark blacks to bright, sparkling highlights. Enjoy your existing Full HD Blu-ray™ collection, upscaled for an exceptional 4K experience – even in 3D. Dynamic laser control and Advanced Iris technology.